How to prepare 1098’s (mortgage interest statements) using W-2 Mate program. 2 ) Click on “1099 & 1098 Recipients” icon from the left toolbar inside W2 Mate. 3 ) Enter the Payer/Borrower information. By clicking “New 1099 / 1098” recipient. 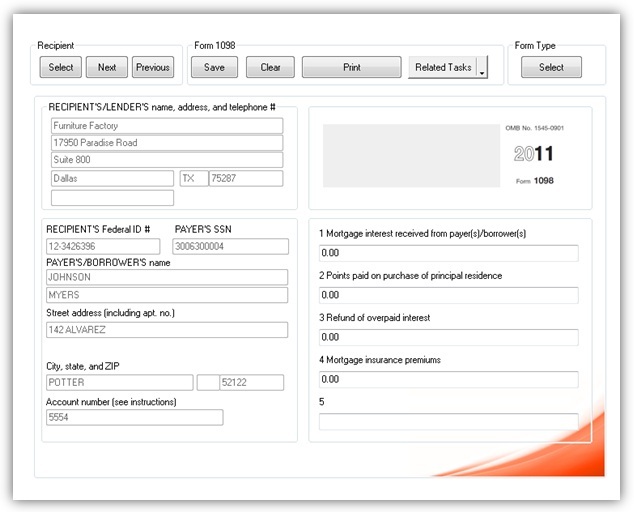 In the dialog that comes up enter basic Borrower information such as name, address, tax id and so on. Make sure to select “Form 1098” under the list of “Types of 1099 Forms Received”. 4 ) Click the “1099 and 1098 Forms” icon from the left toolbar inside W2 Mate. 5 ) Under “Form Type” select “Form 1098” and click OK.
6 ) You should see a screen similar to the one shown below. 7 ) Now fill out the different 1098 boxes for the borrower (s), such as “1 Mortgage interest received from payer(s)/borrower(s)”, “2 Points paid on purchase of principal residence” and “3 Refund of overpaid interest”. Make sure to hit save each time you update a form. 1098 Copy B (1098 Mortgage Interest Copy B): For Payer / Borrower. 1098 Copy C (1098 Mortgage Interest Copy C): For Recipient / Lender. And print / align data on the following form: Laser Copy A of form 1098 (1098 Mortgage Interest Laser): For Internal Revenue Service Center. 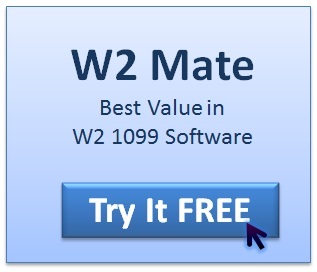 9 ) If you need to file 1098 Copy A electronically you can use the 1098 electronic filing feature inside W2 Mate. 10 ) You can also import 1098 data from QuickBooks, Sage Peachtree, Excel / CSV, Microsoft Dynamics, Sage DacEasy and other software.